Wondering how to store fresh peaches to allow them to ripen to perfection? If you just purchased delectable peaches or just picked some of summer's juiciest best, be sure to store them to allow them to come to their peak of ripeness. Here are tips for how to keep fresh peaches and allow them to fully ripen. What is the Best Way to Store Fresh Peaches? Peaches might seem a little hard when first purchased or picked, but this is because they are "climacteric fruit". Unlike non-climacteric fruit, for example, strawberries, raspberries and grapes (which, once picked to not ripen any further), peaches are harvested before they are fully ripe, and they continue to ripe after they are harvested. In fact, it is important when choosing peaches to purchase at the grocery store, that you avoid peaches that are too ripe to begin with. Peaches that are too ripe, bruised or deteriorating will be rotten in a very short time. Over-ripe peaches often have a "wrinkly" peel/skin. The colour of a peach does not indicate ripeness as the blush of the peach varies with the type or variety of peach. Peaches purchased from the grocery store should be firm to the touch, and then allowed to fully ripen for a couple days at home to the peak of ripeness. Peaches are picked a little under-ripe and have to mature for a few days at room temperature to soften them up. Once ripe, peaches should be stored in the refrigerator, and will last for about 3 - 5 days). 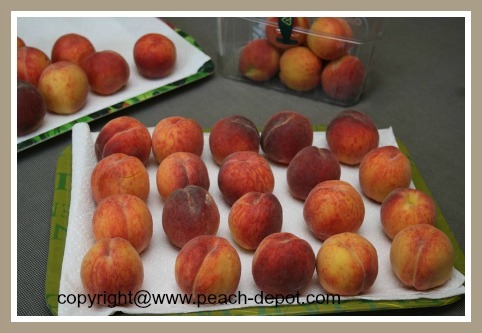 Sometimes it is possible to purchase baskets of peaches that include peaches at a few different stages of ripeness. This is ideal, however, in my experience, most peaches in baskets purchased from the local grocery stores are made up of peaches that are all at the same stage of ripeness. if you have purchased peaches in a basket or other container, gently remove them by hand, one at a time, and place them on a paper-towel lined food tray (see image above). This will take the pressure off of the tender fruit deeper in the basket/container and thus help prevent the fruit from becoming bruised and deteriorating. sort fruit generally according to ripeness., and discard any fruit that has deteriorated (rotten fruit which is stored with fresh fruit will cause the good peaches to deteriorate rapidly as well). allow the peaches to ripen on the kitchen counter at room temperature until they reach their desired ripeness. Do not store them in the refrigerator. to quickly ripen your "firm ripe" peaches, add a high ethylene fruit (fruit ripens in the presence of a gas called "ethylene", found naturally in the fruit), for example, an apple or a banana and place it in a closed paper bag on the counter with the peaches that you wish to ripen quickly. 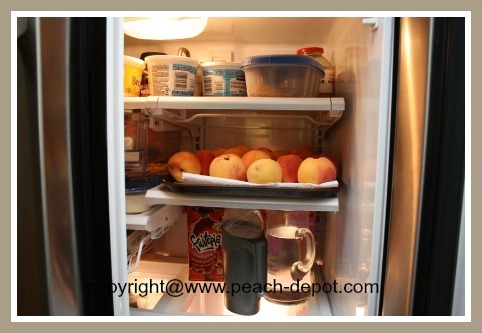 once the peaches have ripened, gently transfer them to the refrigerator. The peaches should last an additional few days. for optimum flavour, allow peaches to reach room temperature before eating (about 30 minutes). Note - do not rinse peaches with water until you are ready to eat or use the peach. Peeled, sliced peaches can be sprinkled with a few dashes of lemon juice or tossed with a citric acid solution to help prevent or slow down the fruit-browning process. You can purchase ascorbic acid (also known as Vitamin C), for example "Fruit Fresh" which helps prevent many different fruits and veggies from browning. The ascorbic acid is mixed with water and the fresh produce is tossed in the solution. I use "Fruit Fresh" on occasion and I find it works well. Ascorbic acid such as "Fruit Fresh" can be purchased in most grocery stores, or you can order it online at *Amazon.com (Click on image above for more detailed product information and customer reviews). 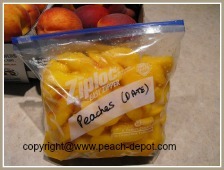 If you wish to store/preserve peaches for later use, you can very easily freeze or can them (see links below). Store frozen peaches for making delectable peach smoothies, pies and more! 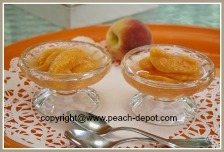 Canned peaches make scrumptious, refreshing desserts!